Whatever the results of the Local Council election tomorrow, one important factor is clear. The sovereign people, most of them now well informed largely because of high technology — will no longer tolerate corrupt politicians. I have been in the field in Sri Lanka for over 4 months, and I am happy to report that a significant STEP towards the Liberation of our Motherland from the clutches of the PARA-GATHI DESHA-DROHI Yamapalanaya will be taken tomorrow, the 10th of February, 2018, exactly 200 years after the UVA-WELLASA Uprising in 1818! This is not the BEGINNING nor the END, nor is it the END of the BEGINNING, but perhaps it is the BEGINNING of the END of the DESHA-DROHI Yamapalanaya! The HOPES and DREAMS of the Patriots of Lanka ride on this election. Let us hope and pray that ALL PATRIOTS will do their BOUNDEN DUTY to PROTECT the Nation at this LONG-DELAYED ELECTION and BANISH these ENEMIES of our Motherland from the HELM of our country. JAYAWEWA Deshapremini! Oba hamata JAYAWEWA! 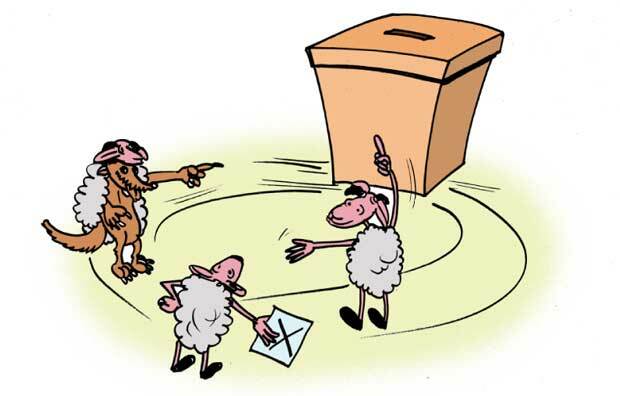 At 8.00pm Sri Lanka time, a VERY HIGH TURNOUT, in excess of 80% of registered voters, has been recorded in Local Govt Elections on Feb 10, 2018. Have Sri Lankan PATRIOTS done their YUTHUKAMA to PROTECT their beloved Motherland? I THINK SO …. stay tuned …. ALL RESULTS are expected to be released by MIDNIGHT today!